I wasn’t anymore satisfied with the classic leather wallet we are all used to. 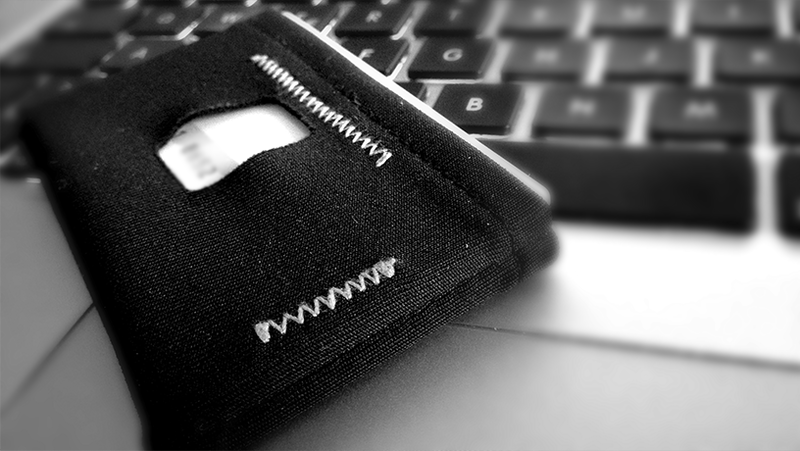 Bulky, unhandy, with too many unnecessary things that I ended up taking with me… Most of us, men, bring the wallet in our back pocket, even if it’s handy when you are standing, it become annoying when you sit down, and with that you end up giving your cards a shape like this ~. Fed up with these problems, I decided to try a new type of wallet. Obviously, the right place for this research is Kickstarter. It wasn’t easy at all, me and others on Twitter were discussing for weeks on it… but in the end we found something. These are just some of the names that you are going to find in that cauldron of new ideas and creations. Among these, only one has convinced me to back it, the Dash Wallet. I’ll start by saying that after trying it for a little more than a week, I am satisfied, but not at 100%. Convenient for people like me who had have abandoned coins in their wallet, it limit us to bring back only a few cards (driver’s license, credit cards, etc.) and some cash, and if you live in a country like mine you should have some spare ones. As you can see from these photos and videos access to the cards is very easy, especially for the “favorite one”, but because of that favorite card the Dash has missed a detail that makes me sad. As you can see from the photo at the beginning of the post, around the hole are formed horrendous ripples caused by the elastic material with which the whole Dash is realized. One small problem, at least for us in Italy, it’s the identity card. I think that here almost no one has the “new” CIE (an electronic id card), we all have the old and “classic” paper one, which is unwieldy even in a normal wallet. So, how can you solve this? Simple, if you have a driver license, you can just bring back the new electronic one as id proof. However, there are some occasions when the identity card is required, and in these cases you will have to bring it with you in some other way, sorry. There is as I’ve sayed space for cash, they are not so easy to take and put back, in fact you will have to bend them twice on themselves. Now I’m with Dash for more than a week and I am very happy to have it. I can finally keep everything I need in the front pockets, I’ll not go back to the old wallet for sure. I’m not saying that I would never change this to something better, but for now I have not found anything better. If you want, since it has reached the goal required for the realization on Kickstarter, the Dash can be bought directly from the official website.